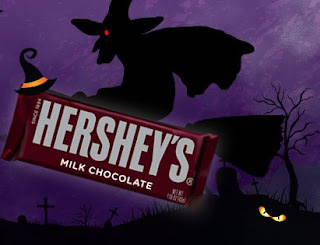 Being Frugal and Making It Work: Hershey's Candy Makes Halloween Complete! I've always been a huge fan of Halloween! Dressing up in costumes, parties, haunted houses, and let's not forget... CANDY! I'll be the first to admit that the candy makes Halloween complete! When we get home from trick-or-treating, my kids can't wait to weigh their candy and then sort through it to see everything that they got. My kids sort it by candy type: chocolate, suckers, licorice, etc... our favorites? CHOCOLATE, of course! Hershey's makes some of our all time faves: Reese's Peanut Butter Cups, Kit Kat, Hershey's Almonds, and YORK Peppermint Patties --- Delicious! For Halloween, they even have Halloween themed designs and shapes on their most popular products. My kids love opening the package to see which design is inside! No matter what the holiday, season or reason, Hershey's is the perfect way to satisfy your sweet tooth! Visit HERSHEY'S Halloween Boo Blvd. to share your Halloween experiences, get Halloween tips and have frightful fun! What is your favorite Hershey's product! Those are the cutest costumes ever!! Love it! Thank you SO much! It's by far my FAVE Halloween EVER!